So much innovation is occurring on the revenue side of new digital media that it's time to review, update and aggregate. Some of the material has appeared in this blog before. Let´s start with the basics. 1. Create community, don't just publish news. An audience is just a group of observers. A community shares values and a deep interest in a topic or geographic area. It often has a bias toward action. That is where value comes in. Connecting these people and creating value for them is the beginning of a community. Only when you have connected them can you begin to get their financial support. I was reminded of the power of community, as opposed to audience, when reading Martin Langeveld's post for Nieman Lab on what was ahead for journalism in 2013. Engage the community where they live and spend their time -- in their physical (if possible) and virtual communities (social networks). This is how PolicyMic has built up a monthly audience of 14 million users in 2 1/2 years. Think like a community organizer. That is how Robert Niles recommends journalists get started. His book is How to Make Money Publishing Community News Online. Texas Tribune, a digital news organization focused on government and education, embodies this way of thinking. It offers six levels of membership and a sliding scale of benefits, from $10 to $500 a year. Think about that. By offering not just a product but access, privileges and opportunities to mix with the community, Texas Tribune is able to charge far more for a membership than it might get from a subscription. MinnPost does the same. On its membership page, we learn that "membership means that you are part of the MinnPost family, helping us achieve our mission through ongoing financial support." Membership brings privileges, discounts and networking opportunities. The asking price is higher than most paywall subscriptions, $120 to $600 a year. LaSillaVacia, a Colombian website focused on investigative journalism about power and politics, has a membership group of 550 "Super Amigos" that in 2013 contributed US $32,000. Their appeal is to people who want to support independent journalism. That is almost enough money to finance their operations for a month. Premium pricing for sponsorships: Texas Tribune offers three sponsorship levels that run from $1,000 to $5,000 a year. Sponsorship benefits include more than just the opportunity to put a message on the website. They include a more intimate relationship with the brand at events. Leo Prieto, the co-founder of BetaZeta in Chile, which has a monthly audience of 10 million users, is turning away from traditional advertising toward sponsorships, which now make up 40 percent of its revenues. Prieto prefers sponsor relationships with brands as opposed to the highly cyclical business of selling impressions and clicks to digital advertisers. Among other reasons, the price Betazeta can charge for traditional advertising continues to fall because of increasingly sophisticated ad-targeting software and automated ad buying. In addition, web titans like Google, Amazon, Microsoft, Apple and Facebook are gobbling up all this advertising. "The advertising business model is dead for everybody," Prieto said. "For television, for magazines, for radio, for everybody. We've started approaching brands about aligning our audience with the audience they want to reach. It continues to be an advertising relationship but a different kind of advertising." "A sponsor is a brand that stays with you in a longer-term relationship and is a close partner." He emphasizes that the partner has no say over editorial content but can have a space on Betazeta's site to tell its own story. Takeaway: A digital media outlet that has a reputation for credibility, strong ethical standards and community service will appeal to many advertisers who want to align their brands with those values. You can still sell the magic of the relationship. This is old-fashioned brand-based advertising. It still works on a community level, despite all the naysaying by data-driven sales organizations. When you think of community rather than audience, you no longer have to fall into the pricing trap of advertising contracts based on CPMs (rapidly falling, by the way), page views, unique users or clicks. Betazeta, mentioned above, is generating about 10 percent of its revenue from content marketing, which means creating editorial content for brands to use on their own sites. It is like the service of an advertising or public relations agency. Brands have suddenly discovered the value of blogs, Prieto says, and are now clamoring for experienced editors and writers to create content for them. The content is not a direct sales pitch but shows the audience useful information, such as how to get the most out of a manufacturer's smartphone, how to strap a child into a car seat properly, how to recycle a company's product and so on. Prieto sees this trend as a growth opportunity for his business. A similar revenue strategy is also being used by MedCity News, a U.S. site with 10 employees that focuses on innovation and research in health care. Founder Chris Seper uses dozens of contractors to produce content not only for its own website but for websites of third parties. They also do contracted research -- white papers. On of the most innovative media in this area is Mi Voz (My Voice) of Chile, a chain of 16 local news websites with dozens of clients. It generates more than US $2 million a year and is driven by content generated from some 10,000 citizen reporters. 37 percent social media consultancy and training programs. The 37 percent from media consultancy involves creating interactive media for third parties. The 21 percent of their revenue that is coming from "community outreach" involves getting sponsors to pay for training people in how to use digital media to report on their communities. The publisher and co-founder, Jorge Dominguez, began his career as a social activist for organizations such as "Wake up, Chile" (Atina Chile). On a visit to South Korea in 2003, he learned about the citizen journalism site OhMyNews, which had a global reach and some 200,000 contributors. The model inspired him to start Mi Voz, using citizen contributors to provide hyperlocal news. LaSillaVacia, mentioned above under memberships, is also using this technique by offering consulting on how to launch a sustainable digital news operation. Publisher Juanita Leon and Creative Editor Olga Lucia Lozano had originally tried doing something similar to MiVoz. They decided, however, that doing consulting for brands distracted them too much from their mission of covering politics and power. Now they travel and give seminars on how to do a media startup and they sell a book based on their startup lessons for about US $10. They know what they are talking about. They have survived for five years. The seminars and book generate revenue and fit with their mission of encouraging independent media voices. Many web publishers are realizing that they can offer products themselves rather than just being an advertising vehicle. For websites focused on local news, local artesanal products would seem like a natural. El Faro, an investigative journalism website in El Salvador, has produced several books based on its investigations, and it offers them for sale on its website, along with other books, music, and artistic products. Vox Media's community for sports fanatics, SBNation, offers ticket sales and exchange services. The Telegraph in England has an online store that sells almost anything you would find in a department store: clothing, household products, gardening, jewelry, etc. A website about the business of fashion in Spain, Modaes.es, maintains an online store that offers printed research, back issues and event programs for US $14 to US $50. Online payment services such as PayPal, Google Wallet, and Amazon can simplify the process of accepting payment by credit card. Even though the community you build is online, its members still crave face-to-face contact. People want to connect and meet others who share the same interests and values. Sponsors who share those values and want to connect with that community are willing to pay for the right to be visible at such events. When the events are aligned with the mission of your publication, they help reinforce your brand as a leader in the community. At a minimum, you could hold brand-building events with a goal of just breaking even. Invite your online community to a happy hour or coffee, get the bar or cafe to offer discounted drinks or free food, and use the event to get close to your readers. You can keep costs down by trading for some of the food and venue costs. The nonprofit Texas Tribune is a great example of event marketing. It generated $1.2 million in 2013 from events and conferences. As publisher of the Baltimore Business Journal, I found many clients preferred a relationship with a trusted, credible brand rather than simply buying advertising space, and they were willing to pay a premium for it. Businesses that wanted to become part of the community paid $5,000 to $25,000 to sponsor a single event such as Best Places to Work, Women Business Leaders, or 40 Under 40, an event honoring up-and-coming business people. Sponsors received a banner and recognition in the printed program as well as mention in advertisements for the event. Ticket sales generated revenue. At some events we sold display booths or tables. Profit margins can be high if you keep costs down. Internet users are willing to pay a premium for data that is organized for them in a convenient format and is searchable. American City Business Journals (my former employer), with 40 newspapers in cities around the country, has been making money this way for years. Each week these newspapers collect data on the largest local businesses in various categories -- real estate developers, law firms, retailers, auto dealers, accounting firms, manufacturers, etc. In digital format these databases sell for $200 per city. In addition, the newspapers publish information from public records sources, such as real estate transactions, new corporations and partnerships, bankruptcies, etc. This information is repackaged digitally and offered for sale. Businesses use this data to find new customers. Capitales, a financial news website for Central America, offers premium information services to clients. Because Capitales collects so much information on the economies and capital markets of the region, it can create special information packages for clients, who pay as much as $25,000 a year for the service. Texas Tribune -- an innovator in events, membership, and sponsorships -- has been an innovator in data. It generates most of its traffic not from its investigative journalism but from its databases of such things as state employee salaries, public education spending, water use, prison inmates, and others. Takeaway: Online users will spend large amounts of time searching and studying a database. Time and attention translate into revenue opportunities. Sponsors will be interested. Many media startups are getting the majority of their revenue from grants, which is not a sustainable position. If a major funder suffers a serious devaluation of its assets or decides to change direction, the media organization that has not diversified could be in big trouble. In 2012, of 18 leading nonprofit news sites surveyed by the Knight Foundation, the eight local news sites were getting 47 percent of their funding from foundations, and the six state news sites averaged 66 percent. Vulnerable, in other words. 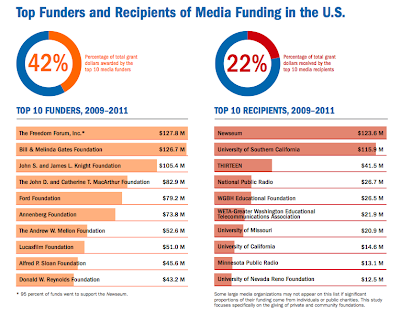 1,012 foundations made 12,040 media-related grants totaling $1.86 billion from 2009 to 2011. Media-related grantmaking grew at a faster rate than overall domestic grantmaking, 21% increase vs. 5.8%, respectively. 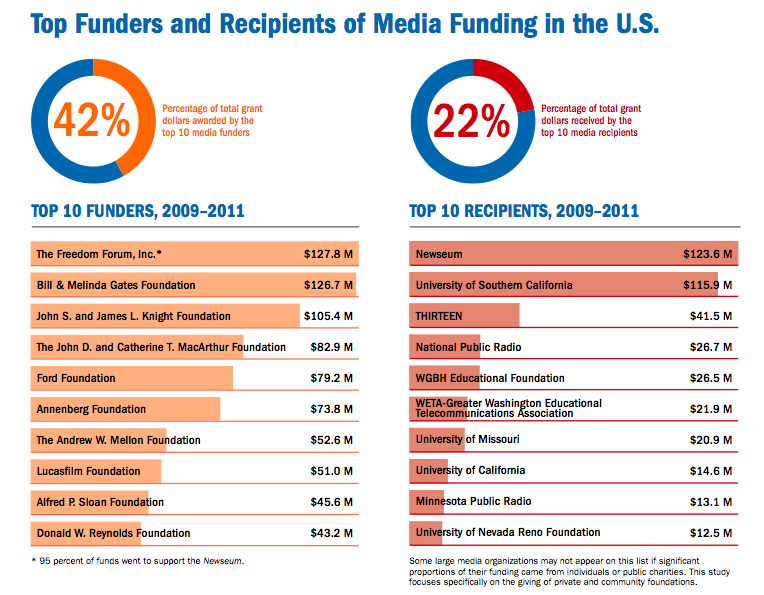 Media-related funding is diverse: Four of the five major areas of media-related grantmaking experienced growth from 2009 to 2011. Media applications and tools led the way in growth (107.8%), while funding for telecommunications infrastructure experienced the only decrease (48.4%). CIPER, an investigative news site in Chile, gets a significant portion of its revenues from Open Society and the Ford Foundation. LaSillaVacia in Colombia gets 52 percent of its revenue from foundations, most of that from Open Society. As traditional media companies lose advertising and circulation revenue to the Internet, civic-minded people worry about the loss of news coverage. They want to see more investment in information. We know about the $250 million Amazon founder Jeff Bezos spent to buy the Washington Post. And we heard about eBay founder Pierre Omidyar's $50 million launch of the independent First Look Media. But below that level of giving there is also a lot of money looking for ways to replace the loss of investigative journalism in regional and local news sites. 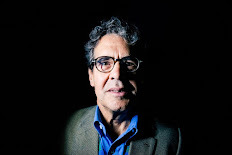 In San Francisco in 2009, billionaire Warren Hellman took the initiative to launch the Bay Citizen, a digital news site focused on the area, and contributed $5 million. He attracted other wealthy citizens and foundations and another $3.7 million to the cause of producing better local news coverage. The operation has since been merged with the Center for Investigative Reporting. The Texas Tribune launched in 2009 with $4 million in seed funding, led by venture capitalist John Thornton, who personally contributed $1 million. It has a staff of 40 and posted revenues of $5.4 million last year. In Latin America, emerging entrepreneurs can be an important force for change. These types of entrepreneurs do not have ties to the traditional oligarchies of business, politics, and media that have traditionally controlled the public agenda. Because of their independence, they support an independent press. In El Salvador, the investigative news site El Faro has benefited from a partnership between the editor, Carlos Dada, and a software entrepreneur, Jorge Siman, for 16 years. Their independence has survived threats of violence and has led to award-winning coverage of political corruption and social issues such as the treatment of Central American immigrants bound for Mexico and the United States. In Peru, the magazine and website Etiqueta Negra has carved out a reputation as a place to go for literary writing and investigative reporting. Part of the reason for its editorial success is its independence. It was started by the Jara brothers, who have no ties to the traditional power structure. It was that independence that allowed the magazine and website to establish themselves as an important voice in journalism for all of Latin America. Mashable reported recently on How News Organizations Are Generating Revenue from Social Media, including real-time ads. Real-time ad widgets allow an advertiser to update the information on a website from their Twitter or email accounts to promote specials and coupons. West Seattle blog offers coupons and deals to its readers. This is a way of attracting local advertisers with small budgets and giving them a low-cost way to see the impact of advertising. He has made a business out of the sponsors he attracts to his weekly program, El Pulso de la República (The Pulse of the Republic). Recent weekly episodes have attracted more than 1 million views each. YouTube has several ways for its video partners to generate money, described here. And he has a message for other young people who are frustrated with the coverage of politics by the major media: if you don't like what they are doing, start your own program or news site, he said in an interview. "If the newspaper doesn't like you, doesn't listen to you, doesn't give you any money, doesn't offer any opportunities, well then, create your own project. Anybody can shoot a video or record a radio program and upload it to the web. The only limitation is what you have in your head." As an editor and publisher of weekly business journals, I was amazed at the emotional language people used to describe our papers. "I love your real estate coverage," some would say, or "my favorite part is the bankruptcies and tax liens" or "I couldn't do business without your Top 25 List". Readers believed the news and data we gave them helped them get leads and ideas to build their businesses. We helped them realize their goals and make money, and they loved us for it. It was their community as much as ours. I like to tell this final story as an example of how valuable the work of local media can be. I hope it inspires local media entrepreneurs. It comes from John Moag, a sports business consultant who was hired by Baltimore Ravens owner Art Modell in 1999 to find a buyer for the team. Moag was trying to make a list of potential buyers. They would have to have hundreds of millions of dollars and deep local ties. Where to look? He described to me how he pulled out his copy of the Baltimore Business Journal's Book of Lists and found the largest privately owned companies. Of the top 10, four were owned by someone named Stephen Bisciotti, who had quietly amassed a fortune in staffing and recruiting companies. Moag sought out Bisciotti, who eventually agreed to buy the Ravens for $600 million. So, a news organization knew its community's interests and produced research that the community valued. And a member of that community knew where to turn when he needed help. There is more value there than the price of a subscription. That is the magic. Finding a Foothold: How Nonprofit News Ventures Seek Sustainability, from the Knight Foundation. Online video's impact is difficult to measure, from the New York Times. The way you describe about the digital news is really meaningful and easy to understand. In your first topic, you explained about to create community rather than publishing news. I am totally agree with it, because if you want to grow your business, you have to become more popular and trustworthy. I think this post will surely help some newbies of market.